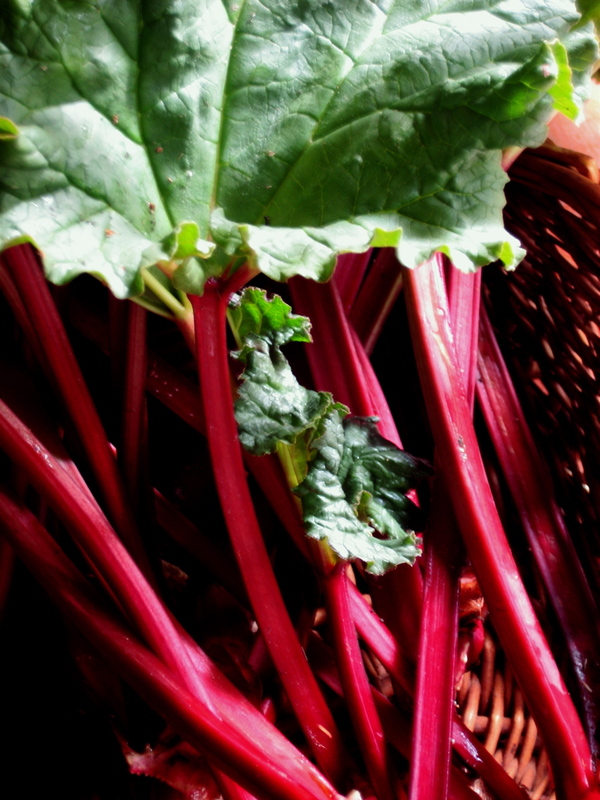 The other day I bought a bunch of rhubarb – it was big and a deep crimson colour with contrasting bright green leaves andlooked so fresh I wanted to eat it immediately . I stewed it with some sugar and now have a huge bowlful in the fridge from which I take helpings of to accompany my porridge. I use real oats (as opposed to the instant variety) and cook them with some dessicated coconut and water (Just 2 mins in the microwave!!). Each morning I pack my oats and coconut mixture and rhubarb and strawberries into little containers to take to work. I also pack whatever leftovers there are for lunch. Today it was leek and pumpkin risotto. I generally eat my breakfast sometime between 9 and 10. Today I got busy. And then I got hungry. At 10 o’clock I was ready to eat my lunch. Porridge wasn’t going to cut it. I waited till after 11 and heated up my risotto. Now its after 2pm and I’m thinking about my porridge and rhubarb. I’m having a topsy kind of a day. The other day I had found a recipe for quail that I thought I could adapt. I bought spatchock, grapes and tarragon, all set to go. And then I read the recipe (I had only really glanced at the ingredients and looked at the picture) only to find that I didn’t have most of the ingredients (my bottle of verjuice had barely enough for a salad dressing, not enough to marinate chicken in). So I adapted once more and ended up with a dish that’s become a favourite. Not only because its delicious but because its so easy to make. Brown chicken (marylands or half spatchcocks or even breasts with the skin on) in a frypan or casserole dish (your le creuset is perfect for this) then deglaze the pan with some verjuice and white wine. If you don’t have verjuice, just use white wine – about a cupful. Place thick slices of lemon underneath the chicken, throw in some tarragon and parsley, cover and let it gently cook. This is a dish that you can’t overcook – the chicken just becomes moist and tender. I’ve served this with Israeli couscous and with roasted potatoes (cooked in duck fat – oh heaven). It lends itself to so many pairing possibilities. I used some of the leftover tarragon in the mushroom ragu (see previous entry) and yesterday (having bought more verjuice) again used it in the chicken dish. I have only just discovered the joys of this herb. For some reason, I had previously been unable to discern any specific flavour in tarragon – it didn’t really taste of anything and I couldn’t’ understand what all the fuss was about. But now I get it and am a fan. Tarragon has a wonderful subtle aniseed-like flavour and pairs well a range of different herbs and goes particularly well with chicken. Contrary to popular belief, pasta did exist in Italy prior to Marco Polo bringing back noodles from China. Sicily had dried pasta in the 12th century (two hundred years before Marco Polo returned bearing the Chinese version of pasta – noodles). Dried pasta had been introduced by Arab traders who had been using it for around a thousand years in a form we know as lasagna (known to the Romans as laganum and to the Greeks as laganon). The term ‘pasta’ only became current in the second half of the twentieth century. Prior to that it referred to a food made with dough (either savoury or sweet). 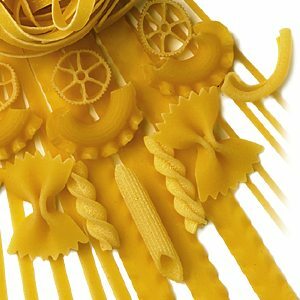 What we know as pasta was referred to as ‘macaroni’, meaning all kinds of dried pasta, a term that had been in use for five centuries. It originated from Sicily and spread to Sardinia and Naples and was then shipped through to Genoa to the main ports of Europe. Thomas Jefferson ate it in France and was so taken by it that he had trunkloads sent home, becoming the first person to introduce dried pasta to the US in the early 19th century. His annual order was fifty pounds, enough for two hundred and fifty meals! He doubled it in 1817, plus an extra fifty pounds for his grandson, and doubled it again the following year. Now that’s a lot of pasta. And so to eat. Which pasta for which dish? So many choices. I love perusing the range of pasta available at the Italian grocer’s and trying to think what each one can be used for. I’m making a mushroom ragout and was torn between a fresh papadelle and a dried squisito. Decisions. I opted for the squisito not just because its so pretty but because of its lovely soft texture when its cooked (squisito needs a longer cook – in fact its best if you overcook it). For my ragout, I’m using a mixture of shitake, swiss browns, cup mushrooms, shimeji (which remind me of those magic mushrooms – goldentops – that we used to pick) and dried porcini (reconstituted in water). I like to have a range of textures and flavours as well as sizes (I chop them into different sizes – makes the dish more interesting). Saute in batches so they become golden brown then make a stock with chopped celery, carrots, garlic, onion and thyme. Reduce the stock to about 2 cups. Add the strained stock and the porcini water to the mushrooms and finish off with some chopped tarragon and parsley. ps: I’ve recently discovered porcini powder – a wonderful way of intensifying the flavour of a mushroom dish without having to spend a fortune for large quantities of porcini. You simply add a couple of teaspoons to the mix of mushrooms and you’re in mushroom heaven. My sister (and her partner) visited on the weekend with the sole intent of eating and drinking. Fair to her, she was prepared to do much of the cooking (though this didn’t actually transpire). She too is a foodie and so part of the enjoyment of the weekend was planning, shopping, preparing and eating food (while consuming much wine). and take it from there. Essentially it was to be an antipasto platter, an insalata, primi (a pasta dish), a fennel and radicchio salad and a secondi (spatchock dish with a grain). Desert, we decided, was beyond us. And so we began to prepare and cook. The idea was that we would have one course, eat, drink, sit, and then prepare the next course. And so on, gradually eating our way through the evening. I have to confess we only got as far as primi and were felled. Fortunately all was not wasted as the rest of the menu hadn’t been prepared and we could continue the next day. A new take on progressive eating. Which we did, beginning with some cheese and a lovely French Chablis and then the radicchio salad, the chicken with couscous and the cavalo nero. Our capacity to become consumed by the idea of the food we were going to prepare and eat far outweighed our capacity to actually consume the food. But it was a great weekend and we did eat (and drink) extremely well. 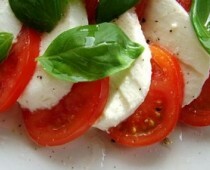 And now for that diet…..
Posted on July 21, 2011 Categories Uncategorized1 Comment on How much is too much? Each time I go to the Fish Markets I swear I will never go again. Not just because it takes forever to turn into the markets and then another age to find a parking spot and the slow crawl to get out, but because I never seem to be able to leave without spending a small fortune on too many fishes. I go with the sole intent (no pun intended) of just purchasing what I came for. But inevitably I see gorgeous produce and my mind starts turning: the mulloway would be perfect for a carpaccio with blood orange and fennel; scallops marinated Japanese style and served on a bed of julienned cucumber and topped with thin strips of nori and toasted sesame seed. 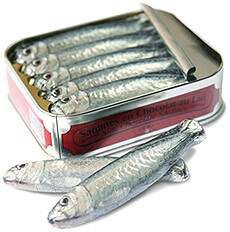 And sardines. I can’t seem to go by these. They’re perfect crumbed in a mixture of panko breadcrumbs, chopped garlic, chilli, and whatever herbs are on hand and then quickly pan fired. And before I know it, I’ve come away with enough seafood for a feast. Happily, I only buy small quantities and we get to enjoy a series of lovely little dishes. So despite the extravagance, it actually serves the purpose of fulfilling a number of needs: thinking about food, shopping for food, preparing food and finally, best of all, eating fabulous food. My yoga studio is just a few doors from The Essential Ingredient. This is good and bad. I used to only go to the Essential Ingredient when I needed a special ingredient I couldn’t find anywhere else. I’d roam the store admiring the products but generally only purchase what I really needed. Now however, after a rigorous yoga class, I pop into the store and browse, never failing to find something that catches my eye – new tumblers that are just right for a late night whisky; lovely glazed terracotta dishes perfect for small tapas; a must-have vegetable slicer (and probably my best ever purchase); white dinner wear in assorted shapes and sizes; round terracotta baking dishes that would be just right for a slow-cooked shoulder of lamb to serve at the table …… always there is something. Then there are those other not so necessary things I can’t resist like beautiful wooden disposable knives and forks as well as the little boat shaped dishes made out of what looks like wood shavings which were just the thing for serving bite-sized bbq’d food. And the noodle boxes. All perfect for my daughter’s 18th birthday party. Oh, and then there were the tiny little 2″ waffle ice cream cones. So sweet, but sadly I couldn’t figure out a way to maintain the production of putting tiny little scoops of gelato into the cones and passing them around before they melted. But I did seriously consider them despite their outrageous price. Sometimes its just a matter of style – and fun. The not-so-essential ingredient. Each year my workplace organizes a World’s Biggest Morning Tea in support of Breast Cancer Research. Traditionally each department has donated a hamper filled with all manner of things that everybody wants to bid on. eg, one year my dept donated a 3 course dinner for 6, complete with matching wines, table service, flowers and a professional opera duo to serenade diners. Another year we organized a range of Victorian wines. There have also been fabulous pamper packs away, with people donating use of their beach houses and throwing in day spa sessions, dvds, etc. You get the drift. These are prizes worth bidding for. We raise a large sum on money and it’s a truly enjoyable occasion, full of good will. This year the organizers decided that it would be easier for people just to donate items that can then be sorted into appropriate hampers. People seem to have taken this as an inducement to get rid of their unwanted gifts/crap. Raid your cupboard for unwanted items. There was even one of those DJ’s free Mothers’ Day gift packs. It totally befuddled me. They are expecting their colleagues to bid on these “pamper” packs in order to raise money for a very worthwhile cause. Where’s the incentive?!!! How stingy. How mean-spirited. In response to this my dept has decided to make up its own hamper. We’re all keen cooks/foodies and with that in mind, have put together an Italian cooking hamper complete with a copy of the Food Safari Italian Feast, porcini flavoured oilive oil, aborio rice, beautiful handmade pasta, wood roasted capsicums, a bottle of vino cotto, bortaga, a bottle of Little General olive oil, a nice bottle of prosecco and a chunk of Reggiano. I suspect we’re going to try and outbid each other for this. There’s something very nice about working with people who love and appreciate food. They’re generous. My emails to friends and family tend to consist of musings on food: what I’ve cooked, great recipes I’ve tried, food I’ve eaten, places I’ve been, wine I’ve liked. Sharing food is an integral part of my life and I hope that this blog will inspire others to do the same – even if its just writing/talking about it. Preferably with a glass of wine. All things are better with wine. Enjoy. Posted on July 4, 2011 Categories Uncategorized2 Comments on Hello world!